The days of keeping our legs hidden away under a cosy pair of jeans are numbered. Here in Hong Kong the seemingly endless summers (and, if you’re lucky, a few beach getaways) mean the arms and legs are out and on display more often than not. If you are tired of the waxing / epilating / shaving / hair removal cream cycle, then it is time to consider laser hair removal at Glow Spa, and winter is the perfect time to start! It is essential to be fully informed before you begin laser hair removal treatment, so here is the full lowdown on laser hair removal in Hong Kong so you can get those pins and pits perfected! Laser hair removal is one of the most popular and most frequently performed cosmetic procedures. The treatment area is exposed to intense light of a single frequency. The pigment in the hair absorbs the light and converts it into heat energy that preferentially heats the hair and the root ball and reduces oxygen around the hair follicle causing damage to the hair root and reduces the ability for the hair to regrow. There are salons and clinics in Hong Kong, including Glow Spa, that provide excellent service, have well-maintained equipment and knowledgeable and experienced staff who apply best practices. However, it is important to understand that there is almost no regulation of the use of lasers and light therapies in Hong Kong and you might be shocked to learn many salons have unqualified staff operating laser equipment. It is essential to do your research in advance and ask the clinic or spa about the qualifications and experience of their therapists. I have seen first-hand that these machines can cause painful injuries, not to mention permanent scarring, in the wrong hands. At Glow, only our CIBTAC Laser and Light Therapy qualified and experienced staff work on IPL, SHR and Laser Hair Removal. After laser hair removal, many clients do not have any hair regrowth for many years. Some customers find they may need a touch-up treatment once every one or two years, and a few people may need a touch up more frequently. It varies from person to person. While often described as “permanent” hair removal, the correct description of this type of hair removal is permanent hair reduction. Laser hair removal is not pain-free. You will be able to feel the treatment; it is likely there will be a slight discomfort or small amount of pain. The feeling is similar to a hairbrush rolling against your skin, or a rubber band snapping on you. All of the modern equipment has some form of built-in cooling mechanism, cooling the skin and tissue surrounding the treatment area to ensure minimal discomfort. Unlike many other spas, we request that you do not apply numbing creams or take painkillers before your treatment. It is essential that you work with your therapist; he/she will work with you to figure out the correct setting for you and your skin type only if you’re able to provide accurate feedback on what you’re feeling. If you aren’t able to provide accurate feedback, you are risking injury. Remember, there is not a direct correlation between the pain level and treatment effectiveness. You cannot reduce the number of treatments required or get a quicker result, by increasing the intensity. The success of this treatment depends on a combination of the correct light intensity setting, the time between treatments and the number of treatments performed. The best results are seen when you have dark hair in the treatment area and light skin pigmentation; however, laser hair removal technology has come a long way in recent years and lighter hair and/or darker complexions can also be treated. The most commonly used laser is the Diode 808 nm laser. 808 nm lasers are considered the gold standard in laser hair removal because they are suitable for use on almost all pigmented hair and skin types — including tanned skin. 808 Diode lasers may also be used with darker skin types, however, for Fitzpatrick Skin type VI (very dark brown/black skin types), I would recommend a Nd:YAG laser rather than the 808 Diode laser. What Should Happen in My Consultation? The purpose of the consultation is to ensure you are a suitable candidate for the treatment and to do a patch test if you desire. It also gives you an opportunity to meet your therapist or clinician. At this first meeting, you should ask questions, making sure you are comfortable with the environment and the knowledge and professionalism of your therapist. It would be very likely that you are asked to complete a client consultation form. At Glow, we walk you through all of the risks, advise you of the pre-treatment precautions and post treatment care, and walk you through all of the paperwork. You should be asked to complete a consultation form including the Fitzpatrick skin type questionnaire and further questions including some about your regular sun exposure, if you are pregnant or breastfeeding, suffering thyroid problems, hormonal problems or other health issues. Your therapist should walk you through the treatment procedure, what you should expect and guide you on the anticipated number of sessions required and the expected cost. While it is very important to understand the cost of the treatment and any offers that may be available, this consultation time should not be a high-pressure selling experience, as so often happens in Hong Kong salons. Your therapist should be just as happy for you to pay for one session as for six. If you feel in any way pressured or uncomfortable, do not go ahead. As a guide, at Glow, we offer single session treatments for touch ups. For new treatment areas, we offer courses of six treatments followed by twelve months of free follow-up sessions. It can vary between 4–8 treatments, depending on the machine, your hair and skin pigmentation and the coarseness of the hair you are treating. At Glow, we usually see 70% hair reduction within 4–5 treatments for most clients. If you are being asked to purchase more than 8–10 laser sessions, then it is likely the clinic is either not using a laser at all or may be using an older machine. While not necessarily a bad thing, all salons and clinics structure their treatment courses differently, it should prompt you to ask more questions to understand why they feel this number of sessions is a requirement. How Long Do I Leave Between Laser Hair Removal Treatments? It is recommended to leave four to six weeks between treatments. At Glow, we recommend that you book your 1st, 2nd and 3rd appointments four to five weeks apart. As you move onto your 4th, 5th and 6th treatments you may find that you need to wait for five, six or seven weeks between treatments as the hair growth becomes impeded over time. Is This Treatment Suitable For Men? Yes – laser is absolutely suitable for men. With male hair removal becoming increasingly popular, laser hair removal is an ideal treatment for those wanting a smooth chest or hair-free back. The treatment is suitable for almost anywhere on the body including underarms, ears, sideburns and legs. At Glow, we may use SHR or 810 or 808 continuous movement treatments for men, these treatments are particularly suited to the larger treatment areas typically required by men (like back and shoulders). Unlike the older IPL technology, the modern machines use continuous movement, rather than focusing on one patch at a time. The larger area of the SHR head also means treatment times for larger areas can be less than that for laser treatment. There are specialist men’s clinics for the treatment of more intimate areas, and most professional clinics or salons can give you a recommendation if required. What Is The Difference Between IPL, SHR, And Laser? All three treatments use light to impede the growth of hair; there are differences in the application of the science, and the suitability of each depends on the client and their requirements. Laser hair removal uses a single concentrated beam of coherent light at a specific wavelength – 808nm that will target melanin in the hair, heat the hair shaft and damage the hair follicle inhibiting new hair growth. IPL or Intense Pulsed Light uses a high-powered beam of incoherent light. The light pulses produce light in a wide band of frequencies that can heat not only the hair root but also the surrounding tissue. IPL is not laser. While in principle the process of damaging hair follicle to inhibit growth using IPL is similar to laser, it is less targeted so may require more treatments and presents a higher risk for burns especially on darker skin tones. SHR is a new non-laser technology; SHR stands for Super Hair Removal and is emerging as one of the more popular treatments for hair removal. SHR works by gradually heating the dermis to a temperature that effectively damages the follicles and inhibits hair regrowth. With traditional laser or IPL technologies, energy is transported to the hair root through melanin, where heat of 65-72° Celsius is produced. SHR technology, only partially utilises the melanin path, using low energy with high-frequency delivery. This penetrates down to the follicles which produce hair growth, however, unlike Laser or IPL, the skin is only heated to 48° Celsius. SHR is ideal for large treatment areas, and to treat lighter and finer hair. SHR is a very effective and safe form of hair removal, and for many is more comfortable than laser hair reduction. At Glow Spa, all three forms of hair removal technology are available, and we are delighted to discuss the pros and cons of each and help you decide which is the best treatment for your hair and skin type. Is Laser Hair Removal Safe? What Are The Risks? What Are The Side Effects? The combination of the right salon, the right therapist or clinician, and the right laser machine, for you and your skin type, will significantly reduce your risk of injury when you have a hair removal treatment. The right salon or clinic for you is the one where they have demonstrated to you that their priority is your results and your safety. Do your research and don’t hesitate to ask questions. There are no silly questions when it comes to your safety, and the salon manager or your therapist should be prepared to give you as much information and time as you need without pressuring you into making a decision. Avoid clinics with high-pressure tactics. Prices are important, but should not be the main topic of discussion. Prices may vary and may be negotiable, but be wary of salons or clinics with very high prices and massive discounts, or a very reduced first-time price as long as you purchase several treatments. You should also be wary of clinics or salons offering ‘trial’ prices – there is no ‘trial’ with laser hair removal, as most people are unlikely to see a significantly noticeable result after their first treatment. “Trials” are often a tactic used to get additional time with you in the treatment room to sell you a course of treatments. With that said, this does not negate the importance of a patch test. If your therapist would like to test a small area of skin, before completing the full treatment, or if you would like to have a patch test before treatment, this should not be an issue for the clinic and should be performed at no charge. You should expect a follow-up call or message from your therapist or clinician in a few days to check on the reaction of your skin. Your therapist should also be able to give you an indication of how many sessions you would need. While you may require touch up sessions after your course is complete, you should only ever need to purchase one course – this should not be ambiguous. Choose the salon or clinic with the laser (or IPL or SHR) that suits your skin type. If you are concerned, ask for a patch test. Laser hair removal is not recommended for the eye area this is due to the possibility of severe eye injury. During your treatment, your therapist should provide you with a pair of goggles; this is standard practice. If you are required to bring your own or purchase goggles, or if you are given a choice of not wearing goggles, this should give you a warning that this clinic or therapist may not be fully trained or adequately concerned for your safety. All forms of light therapy require the use of a gel, if your salon does not use gel, charges you for gel, asks you to purchase gel separately or offers a discounted price if you do not use gel it is NOT somewhere you should consider doing this treatment. Gel is not optional. You will need to shave your hair, treatments performed without shaving are likely to be very painful and will increase your burn risk. The therapist performing your treatment should be both qualified and experienced. Often the best technicians are those who have the most hands-on experience, but in Hong Kong, it is also essential to ensure that the person performing your treatment has completed their training and has a recognised qualification. Side effects include skin irritation, temporary discomfort, redness and swelling, these typically disappear within 12 – 24 hours of your treatment. Every so often, a treatment may result in crusting/scab formation, bruising, purpura (purple colouring of the skin), and temporary pigment change (hypopigmentation or hyperpigmentation). Occasionally, even though appropriate settings have been used, laser hair removal can cause changes in skin texture that are not the fault of the technician. In some other rare cases, greying of treated hair may occur, and paradoxically the laser treatment may stimulate hair to grow excessively in or around treated areas, this outcome is also not the fault of the laser or the technician. Care should be taken when using a laser (or any light treatment) on a tattooed area, as the light may affect the colour of the tattoo. What Do I Need To Do Or Avoid Before And After My Treatment? For the treatment to be effective, the hair root must be intact. This means you should avoid waxing, epilation, plucking or any other root removal technique for five to six weeks before your first treatment. This usually leaves most people with shaving as the only option in the few weeks before their first treatment. There needs to be some hair growth before your consultation and first treatment so if you do shave, try not to shave for the final 3–4 days before your first treatment. Your therapist or clinician can also help shave the area if needed for your first treatment. Before your treatment and for two to three days after you should avoid exposing the treated area to the sun. The treatment should never be performed on wind-burnt or sunburnt skin. Advise your therapist if you have recently used a sunbed, treatments should not be done two weeks either side of a sunbed session. Retinol A makes the skin more photosensitive; it is recommended that you stop using Retinol A creams one week before hair reduction treatment. Exercise is not recommended after your laser treatment. During a laser hair removal treatment heat is applied to the skin resulting in erythema (redness) and follicular oedema (swelling of the follicles) these temporary side effects last for approximately 12 – 24 hours. It is important to keep the skin cool after your treatment, as the follicles are heat sensitive at this time, it is important to avoid any activity that may bring any further heat to the skin. Also, physical exercise will usually cause you to sweat and sweat may contain bacteria which may aggravate the sensitive hair follicles, resulting in a rash or skin infection. This is particularly important in Hong Kong; when you are having treatments over the summer, try to plan so that you are in a cool and air-conditioned environment most of the time after your treatment. To avoid skin irritation, wear loose cool clothing after your treatment. If you can, avoid skinny jeans and tight leggings. Have a luke warm shower rather than a hot shower and avoid creams, moisturisers, oils and perfumes on the treatment area for 12 – 24 hours after your treatment. 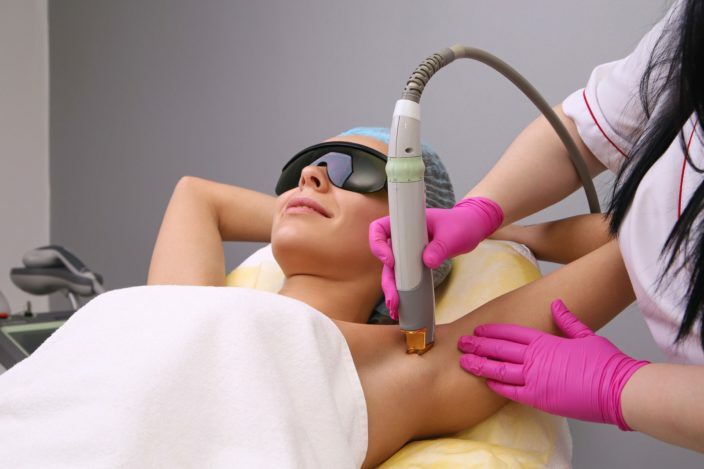 Laser hair removal can vary in price from clinic to clinic, from men to women. As a guide, you should plan on spending between $4,500 – $6,000 to treat your underarm area and between $25,000 – $30,000 to treat your full legs. Laser hair removal can be amazing, just imagine, never having to wax or shave again! Just make sure you ask the right questions and pick a reputable salon. Laser hair reduction is not a treatment to book based on price alone – if it sounds too good to be true, it probably is. At Glow Spa, we have a friendly and knowledgeable team, and our qualified therapists are experienced in every aspect of keeping you looking and feeling your very best. Please come along for a no-pressure laser hair removal consultation at Glow Spa, 9F Parker House, 72 Queens Rd Central and see what you think, or just call us on 2525 5198 to chat through the options. We’re offering 5% discount on our already very competitive pricing for single session laser hair removal treatments and laser hair removal courses when you mention reading this article on the HK HUB. Find out everything you need to know about fighting the Hong Kong frizz and choosing the best smoothing or straightening treatment for you.